If you’re familiar with Padesky & Mooney’s (1990) generic model of CBT, commonly known as a five-part model or a Hot Cross Bun diagram, you will recognize the general format employed in the nine-part model (Figure 1). 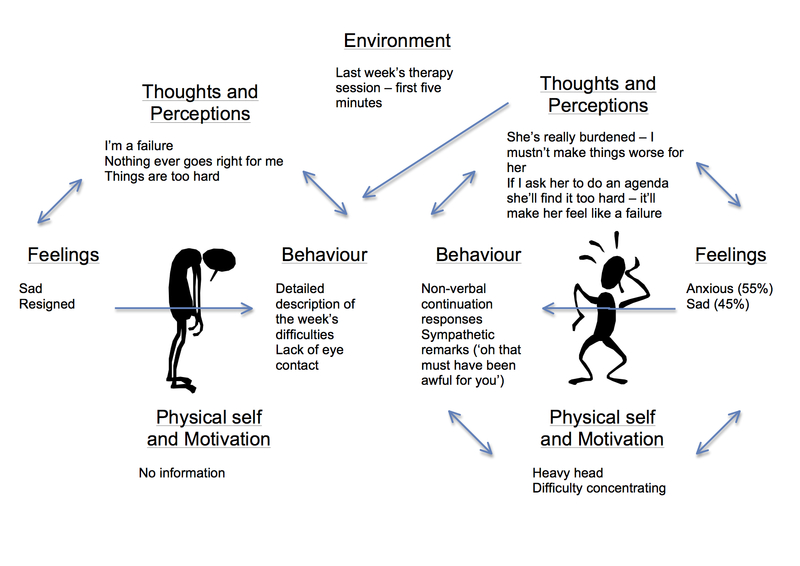 The generic model (Figure 2) is a diagrammatic problem formulation used to help clients understand their difficulties by eliciting links between the current environmental context and appraisals of events, emotional and physiological responses, and subsequent actions. The generic model is predicated on the hypothesis that cognitions mediate between circumstances and their emotional consequences (Beck, 1976). Functional analysis, on the other hand, focuses on contingencies, that is, the antecedent conditions, behaviours and consequences. Consequences are reinforcing events that follow from specific acts occurring in specific contexts. Antecedents are the conditions that give rise to specific acts, that is, the controlling variables that elicit behaviours (Jacobsen & Christensen, 1996). Neither theory, I would argue, does a particularly good job of helping clinicians to formulate dyads, such as a couple in an intimate partnership, a parent and child, or a therapist and client. 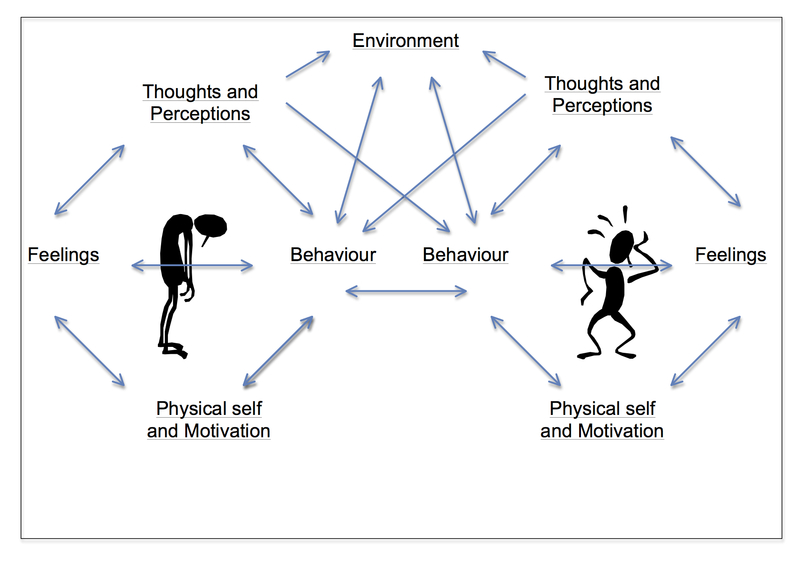 Systemic family therapy models, in particular the Milan model, focus on the impact of behaviours and beliefs within an interpersonal system, such as a family (Selvini Palazzoli, Boscolo, Cecchin and Prata, 1980). 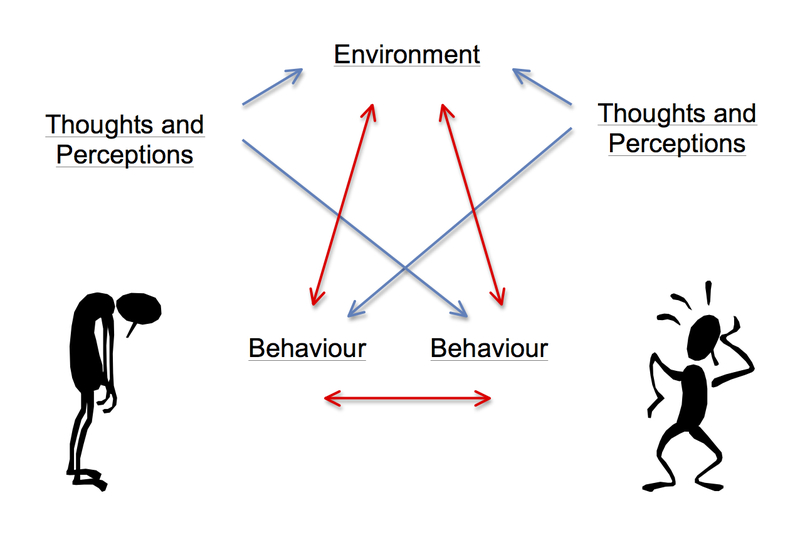 A reciprocal pattern of influence is elicited, typically through circular questioning that serves four functions: to 1) define the problem; 2) describe sequences of interaction; 3) compare and classify behaviour, beliefs, values, thoughts, feelings and relationships; and, 4) intervene through encouraging new behaviour (Brown, 1997). Hypotheses about the reciprocal impact of behaviours and appraisals are typically presented verbally or in the form of a therapeutic letter. The existential phenomenology of R. D. Laing and the Personal Construct Psychology of George Kelly each focus on individual phenomenology as experienced within reciprocity of experience. Both employ the metaphor of two mirrors placed opposite each other, each infinitely reflecting the other (Monte, 1980). 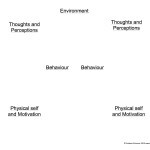 This constructivist model of interpersonal phenomenology regards experience as essentially co-constructed by active, meaning-making agents. In a constructivist epistemology there is no place behind the mirror to apprehend reality directly, only the continual co-construction of experience. 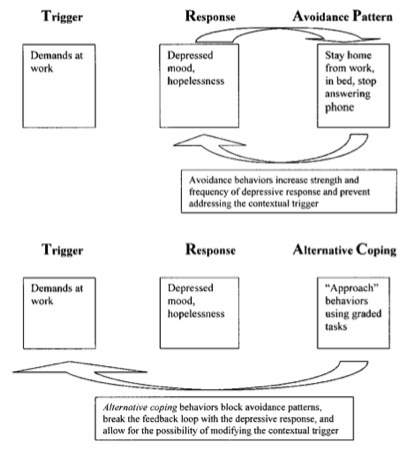 Teichman developed a reciprocal model of depression (Teichman & Teichman, 1990) that integrated Betalanffy’s system theory, Bandura’s “reciprocal determinism” and Beck’s model of depression. The model was further explicated in a case report (Teichman, 1992) in which it was hypothesised that there is a constant reciprocal process between cognition, emotion, behaviour and environment occurring both within (intrapsychic) and between (interpersonal) persons. Symptoms are therefore a consequence of “dysfunctional reciprocities and relationships” (p332) and could be mapped as a conceptual tool to guide interventions (Figure 4). The nine-part model clearly shares many conceptual and visual features of Teichman’s Reciprocal Model, although when I developed the nine-part model in 2006 I was unaware of Teichman’s work. It arose out of practical necessity when working in a primary care psychological therapy service in South Auckland, New Zealand. The work brought me into contact with many Maori (tanagata whenua) families. In order to try to conceptualise individual difficulties I endeavoured to try to understand the cultural context in which they arose. As I worked with tangata whenua clients I learned that individuation is intimately tied to tribal affiliation and familial role. I wanted to find a way collaboratively to develop and share hypotheses about the maintenance of distress that reflected both intrapersonal and interpersonal factors. In trying to encompass multiple perspectives on events I started to draw mirror images of the five-part models I had been using and found I was able to formulate and communicate a reciprocal maintenance of distress in diagrammatic form . Whilst this model remained limited to dyads I found that it started to represent some of the complexity of real people living their lives in a world that does not respond passively to their actions, but also appraises and acts in response itself. It is my opinion that the nine-part model has some advantages in some situations over Teichman’s model as it represents a less deterministic relationship between elements and has greater flexibility in demonstrating pathways of influence between elements. I have used this model subsequently in my everyday practice with individuals, couples and in supervision. I have also taught the model as part of the process of assessment and formulation of couples in Couple Therapy for Depression (Hewison, Clulow & Drake, 2014) to help therapists from differing backgrounds to formulate and share reciprocal maintenance cycles. I hope that the following examples will demonstrate that it can be of practical value in the everyday clinical work of psychotherapists. Kuyken, Padesky and Dudley (2009) discriminate between three levels of conceptualisation: the descriptive, cross-sectional and longitudinal. The nine-part model is intended to be a tool that can accommodate all three levels of formulation, but primarily the descriptive and cross-sectional. It is both a tool for the therapist to conceptualise the relationship between intrapsychic and interpersonal factors in the maintenance of distress, but also, crucially, to communicate that description. Whilst it draws on cognitive, behavioural, systemic and constructivist perspectives it makes no a priori assumptions about the factors that mediate distress. It is in essence a reconfiguration of the generic model to formulate dyadic interactions as dynamically evolving interactions between participants who are actively making meaning of their encounters and acting on that understanding, whether that meaning is implicit or explicit. Through repeated use, cross-sectional themes emerge, and with the addition of individual vulnerability factors as moderating and mediating influences on cognition and behavioural repertoire it is also possible to incorporate a longitudinal perspective. Beginning CBT therapists often make the mistake when using the generic (five part) model of making too many links between variables. This has the effect both of confusing themselves and their clients, who, not being trained therapists themselves, understandably find it difficult to grasp what are effectively complex flow-charts or algorithms. Nonetheless the model has the benefit of communicating to clients that a change in any one domain will inevitably have consequences in the others. Because of its increased complexity the nine-part model suffers and benefits from both these factors. 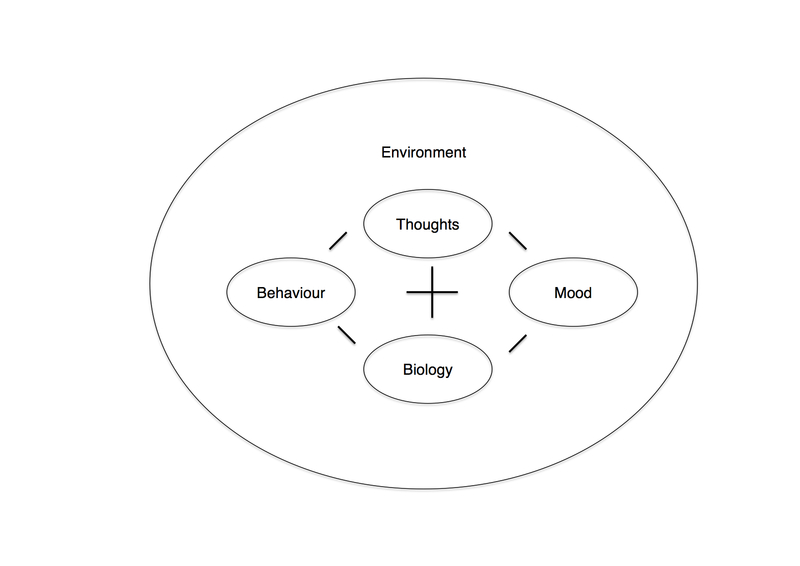 Specifically the model directs clients and therapists to the understanding that behaviour has both a direct impact on the other person but might also affect the other person indirectly by altering the environmental context. In a simple example, if one person is a spender and the other a saver then the behaviour of one partner will alter the resources available to the other. 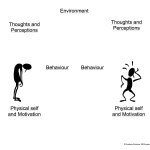 Similarly the nine-part model makes clear that appraisals of both the environment and of each other’s behaviour are subject to misinterpretation, distortion or selective attention. Over the years that I have been using the model I have come to some conclusions about how it is best used in practice. Firstly, in the generic model the environment is drawn as encompassing the individual and the position of the other four elements is arbitrary, leaving no easy way to describe an interaction between behaviour and its environmental consequences. In the nine-part model the positioning of elements is important. Behaviour is drawn on the left side of the right-hand figure and vice versa. This is done so that the interactions between behaviour can be shown without the necessity for reference to the thoughts, emotions and physiological responses that are happening ‘behind the scenes’, so to speak. The impact of significant distressed behaviour, such as the climax of an escalating pursuer-distancer interaction, can therefore easily be described and simple ‘shaping’ processes explored. Thoughts and perceptions are placed above the figures (“screen beans” are optional, stick figures or emoticons do just as well, or even no figure at all). This enables the relationship between a specific behaviour and its interpretation to be described using simple arrows. It also enables more vulnerable thoughts that aren’t being shared with each other to be disclosed, improving the chances that a couple will take an empathic stance towards each other. By following up with questions about each partner’s emotional and physical responses, and through the use of ‘downward arrow’ questions, underlying meaning and an accompanying pattern of reciprocal responding can be elicited. This line of questioning can be done in either a linear fashion, as above, or using circular questions. The most salient answers to these questions are then transcribed on to the nine-part model. This diagram then becomes the property of the dyad. Through using the nine-part model repeatedly as a descriptive tool to describe maladaptive or distressed interventions cross-sectional themes can be elicited. This knowledge can be of use to couples in a number of ways. It can help couples to identify recurrent themes of difference that don’t respond well to problem solving. It can help elicit polarization as couples attempt to regulate key aspects of the relationship, such as interpersonal distance. It can help couples identify the mutual traps they find themselves in whereby they are unable to stop acting in ways that are maladaptive, even when they recognize that their behaviour doesn’t lead to the outcomes they hope for. The task of communicating an accurate and credible couple formulation comprising a named theme, polarization process and mutual trap has been described as the primary task of Integrative Couples Therapy (Jacobson and Christensen, 1996). In addition, by representing the formulation diagrammatically couples can be helped to identify and correct the unfounded and inaccurate assumptions each makes about the other’s intentions and motives, for example where verbal interactions that are intended to be supportive are perceived as criticisms. It can also help couples to appreciate the undisclosed or unobserved intensity of emotional responses each is experiencing, so that they can respond to each other more appropriately. The functions described above can also be achieved through a blend of careful questioning and empathic validation. However, transcribing the results of such conversations into a straightforward diagrammatic formulation seems to help couples better to distance themselves from the content of their unhelpful interactions. This can be useful when reprocessing conflict where the risk is that the couple will start to argue again as they become engaged with the content of their disagreement. As a tool to help couples disclose their emotions it can help them feel a greater sense of empathy and connection with each other. It enables discussions to take place about alternative ways of behaving, more accurate perceptions, and more functional ways to disclose or manage high levels of negative emotion. The nine-part model does not necessarily need to comprise all nine elements to be useful. Rather it is the depiction of reciprocal patterns of interaction that is its main function. However, sometimes completing all nine aspects is useful, as in Figure 7. In this example the therapist chooses to focus on the most distressing part of a conflict. The ‘hot thoughts’ experienced at moments of severe conflict are highly likely to be implicated in escalation of arguments and in actions that do lasting damage to the couple’s sense of unity and trust. Thoughts have been rated for their degree of credibility at the time of the incident and emotions for their degree of intensity. Re-rating beliefs and emotions after cognitive reconstruction can help provide feedback to clients about changes in emotional responding or problematic beliefs that reinforce a sense of agency and control. 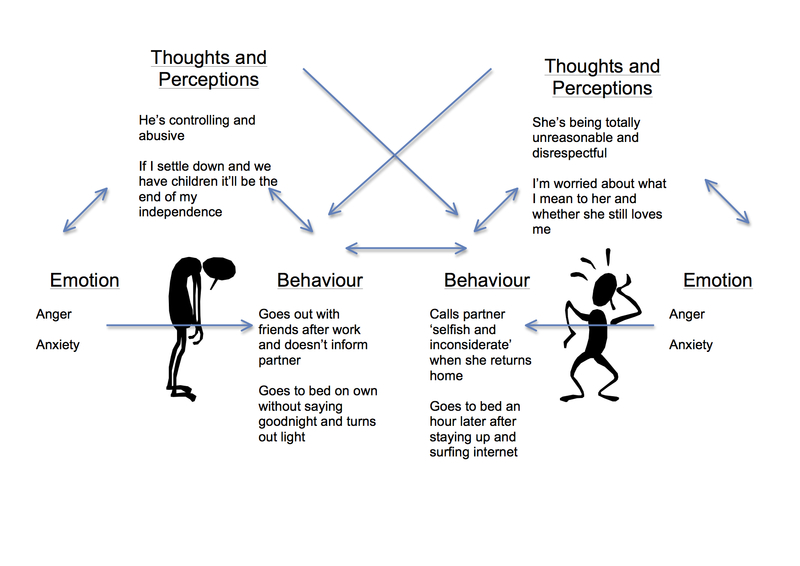 In addition to its obvious use with couples the nine-part model can also be used with individuals wherever there is an interpersonal element to their problems, such as in depression, social anxiety disorder or obsessive-compulsive disorder, where it can be used as an adjunct to a disorder-specific model such as the Clark and Wells model of social anxiety (Clark and Wells, 1995). 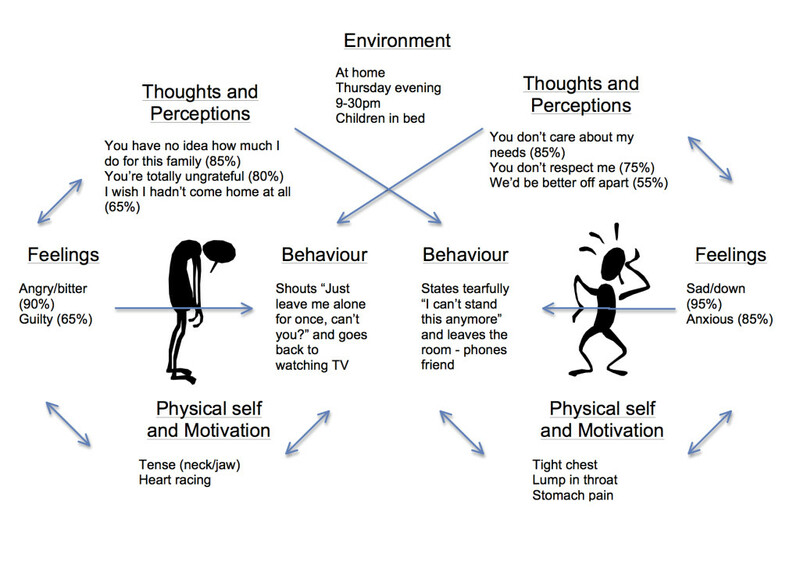 In social anxiety disorder the nine-part model helps to elicit assumptions that the client is making about how others think and feel about them when in a social situation and to highlight how the use of safety behaviours, such as not making eye contact, can have real-world interpersonal consequences that contaminate the social situation and confirm the anxious anticipation that others will judge the client negatively. In OCD or depression the impact of excessive reassurance seeking can be shown in a way that makes both partners’ reactions more understandable and therefore open to change. The nine-part model is also a useful tool in supervision, especially to understand a therapeutic rupture, client non-compliance, or therapist non-adherence. A first step is to elicit the client’s behaviour that is regarded as problematic, then to elicit the therapist’s thoughts, emotional responses and behaviour. Assumptions about the client’s thoughts and feelings are then elicited and tested against available evidence and new ways of behaving are formulated. Therapist: You say that you’re finding yourself really reluctant to set an agenda with this client. When does the problem occur? Supervisee: Right at the start, as soon as she comes in the room. Therapist: And what goes through your mind at that moment? Therapist: and how do you feel when those thoughts are in your mind? Therapist: and because you think that if you ask her to set an agenda it’ll make her feel like a failure and worsen her low mood, and those thoughts make you anxious, what do you do? Therapist: and what do you notice about her behaviour when you do that? Supervisee: well she seems to go into herself. She starts recounting the week’s list of troubles in minute detail. It’s almost as if she’s ruminating out loud. Therapist: and how do you imagine she’s feeling as she does that? Therapist: and what effect might that have on her depressive thinking? Therapist: let’s see if we can make a diagram out of this so we don’t have to try to hold it all in our minds while we think about other ways of looking at the situation, or other things you could do. Is that OK? In summary, the nine-part model is a diagrammatic formulation of dyadic interactions that is used to make recurring patterns of distressed interactions more available for treatment interventions. Whilst it is has not been formally tested for its utility in clinical trials its use in both clinical and teaching practice suggests that it is a useful adjunct to individual formulation. Downloadable blank templates are available below. Clark, D. M. & Wells, A. (1995). A cognitive model of social phobia. In R. Heimberg, M. Liebowitz, D. A. Hope, & F. R. Schneier (Eds. ), Social phobia: Diagnosis, assessment and treatment. (pp. 69–93). New York: Guilford Press. Jacobson, N.S., Martell, C.R., & Dimidjian, S. (2001). Behavioural activation treatment for depression: Returning to contextual roots. Clinical Psychology: Science and Practice 8(3) 255-270. Selvini-Palazzoli, M., Boscolo, L., Cecchin, G., & Prata, G. (1980). Hypothesizing, circularity and neutrality: Three guidelines for the conductor of the session. Family Process, 19, 73-85. Teichman, Y. (1992). Family treatment with an acting-out adolescent. In A. Freeman & F. M. Datillio (Eds.) Comprehensive casebook of cognitive therapy (pp. 331-346). Springer US. Teichman, Y., & Teichman, M. (1990). Interpersonal view of depression: Review and integration. Journal of Family Psychology, 3(4), 349.